The Bridge That Saved A Nation - Historic New Bridge Landing ~ The History Girl! The area around New Bridge was purchased by David Ackerman in 1695. He gave a portion of his land to his son, Johannes, who built a home and tidal gristmill about 1713. David's grandson Nicolas sold the land and mill to Jan Zabriskie and his wife Annetje in September 1745, shortly after construction of the first drawbridge at the narrows of the Hackensack River. This wooden span was called “New Bridge” to distinguish it from an older crossing several miles upstream. Jan Zabriskie built a five-room house in 1752, which is today the oldest section of the Steuben House. It was constructed of blocks of sandstone cut from the Kinderkamack Ridge. The New Bridge brought more commercial traffic to the area, as it was the first river crossing above Newark Bay and along the newly surveyed road (now Main Street). Because the river was tidal at this point, ships and sloops were able to navigate the waters, transporting flour and goods between the gristmill and New York City. Jan Zabriskie would send his sloop to New York City with flour and return with merchandise to sell at his store. Pig and bar iron from as far away as Long Pond Ironworks in the Ramapo Mountains was transported to New Bridge Landing for shipment. The success of Jan Zabriskie's trade and store allowed him to enlarge his residence in 1765. The changes at this time allowed for large parlors, a gambrel roof, a total of twelve rooms, and seven large fireplaces. The enlarged home was now eight bays wide, with two front door positioned symmetrically. The 1888/1889 swing bridge over the Hackensack River. Jan Zabriskie, Jr., a known Loyalist, was arrested in July 1777 and later fled to British-held Manhattan. His property was confiscated by the State of New Jersey in 1781. Zabriskie’s estate at New Bridge served as a fort, military headquarters, intelligence-gathering station, rendezvous, and site of several skirmishes and major cantonments during much of the American Revolutionary War. General Washington set up headquarters at the house on September 4, 1780 for sixteen days while the Continental Army encamped on the Kinderkamack Ridge. 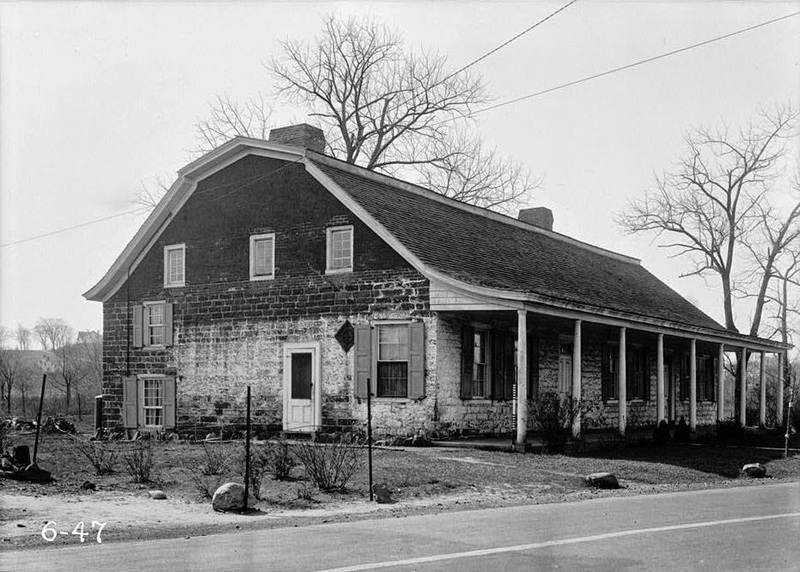 On December 23, 1783, the State of New Jersey presented use of the Zabriskie house, gristmill and about forty acres to Major-General Baron von Steuben, Inspector-General of the Continental Army. According to the provisions of the agreement, von Steuben was to "hold, occupy and enjoy the said estate in person, and not by tenant." According to a claim filed in 1784 by Zabriskie for compensation from the British government for his confiscated property, the estate included, "Outhouses consisting of a bake House, Smoke House, Coach House, and two large Barns, and a Garden...One large gristmill containing two pair of stones adjoining...Meadow Land and two orchards." Captain Benjamin Walker, von Steuben's aide-de-camp and acting as agent for Steuben, purchased the Zabriskie estate on his behalf in 1786. Eventually, the State overturned the rules regarding occupancy of the property. With this in mind, Steuben upgraded and renovated the war-damaged house and sold the house back to the Zabriskie family in 1788 in order to pay for surmounting debts that he owed. Andrew Zabriskie, a cousin, purchased the Steuben House in 1815. His descendants owned the property until 1909. In the 1920s, the Bergen County Historical Society began to raise awareness about the Steuben House. In response, the Steuben House Commission was created in 1926 to purchase Baron Steuben's home at New Bridge. The State of New Jersey purchased the mansion and one acre of land for $9,000 on June 27, 1928. Over the next ten years, the house was renovated and opened as the museum headquarters of the Bergen County Historical Society in September 1939. In 1944, the Bergen County Historical Society purchased eight acres between the Steuben House and a junkyard to protect the Steuben House from encroachment and further development. This wise purchase in 1944 would prove beneficial as two Jersey Dutch sandstone homes would eventually make their way to New Bridge Landing and outlive the junkyard, which was purchased in 2000 as open space and the site remediated through a $1.1 million federal grant. The Campbell-Christie House, another fine example of Bergen Dutch architecture, was constructed by Jacob Campbell, a stonemason, as a store southeast of the intersection of River Road and the highway leading from Old Bridge to South Church, now Henley Avenue, in New Milford, New Jersey. It was built around the time of his marriage to Altche Westervelt in April 1774. His father, William Campbell, operated a tavern on the opposite side of the road. The house was five bays, with a center hall and two rooms deep on each side. It featured a gambrel roof, typical of Dutch architecture of this time, and two large chimneys. William Campbell died in 1793 and Jacob sold the house to Abraham Brower, whose brother, John, a blacksmith, operated a roadside smithy until his death a year later. Blacksmith John D. Christie purchased the house for £250 in 1795 and opened it as a tavern. After his death in 1836, he left the tavern to his son, John J. Christie. It then passed to Jacob Brinkerhoff Christie. On October 31, 1907, Jacob and his wife Eliza sold the home and its 25.5 acres to Theodore Hill of Ridgefield. Six months later, Hill conveyed the farmstead to the Brookchester Land Company. This real estate company surveyed the Christie and neighboring Zabriskie lands into building lots. The Brookchester Land Company made extensive alterations to the house in 1908 and sold it to Anna M. Taylor of Brooklyn on July 3, 1909. The home remained in private hands until the mid-1970s when it was threatened with demolition. To save it, the Bergen County Historical Society partnered with the County of Bergen to move the Campbell-Christie House from New Milford onto the Bergen County Historical Society's lands at Historic New Bridge Landing on condition that the Historical Society occupy, restore, and interpret the building. In exchange, the County of Bergen agreed to pay utilities and to maintain the house. The move from New Milford to River Edge occurred in September 1977. The Demarest House is a modest two-room sandstone cottage that was built in 1794 for miller John Paulson at the time of his marriage to Altie Ely. The land upon which it was built was purchased from the estate of Jacob S. Demarest in 1791. It was originally located at a site beside the French Burial Ground in New Milford. It is four bays wide, one-room deep and its layout consists of two rooms with a small passage in between. There are two entry doors and two fireplaces flanking the gable ends. This type of construction was most popular between 1790 and 1820. As needs grew, a small frame kitchen was added to the west gable end of the house. A doorway beside the fireplace provided access to the kitchen wing. A shingled opening at the rear of the stone house accommodated a "hovel" or frame shed, perhaps used to store tools and fishing net. John Paulison died December 19, 1852. The house and farmstead, then totaling 89.16 acres, was sold in 1853 to Abraham Collard. In October 1855, Collard sold 35.59 acres of the farm and the house to Christian Sackman of Hudson County. Sackman sold the property and home to Carl George Frederick Heine, of New York City. Upon his wife's death in 1921, the estate was divided among her four children. For many years, the house was occupied on weekends in the summer by a group of city artists known as the Pochard Club. The Demarest Family Association was organized in January 1937 to save the old house. Hiram B. Demarest Blauvelt purchased the house from Henry B. Pratt and Henry Rieman, executors of Emma H. Rieman's estate, in November 1939. The house was disassembled and reconstructed at Historic New Bridge Landing in 1955/1956. Today it's two rooms feature a collection of Bergen Dutch furnishings. It was most recently restored in 2009. The Demarest House remains the best surviving example of a Bergen Dutch two-room sandstone house in New Jersey. Since a damaging nor'easter in 2007, Historic New Bridge Landing has not greeted schoolchildren for tours and has not held regular open house hours like all other State Historic Sites. The Steuben House was damaged by floodwaters (much of which has slowly been repaired) and has seen a decreasing interest in general maintenance since then. The site's full-time curator position was removed and funding was cut to the Historic New Bridge Landing Commission. Until the monies are restored to their pre-2007 levels, the Bergen County Historical Society holds events at the site on an almost monthly basis, allowing for visitors to enjoy the site and the building's interiors which tells an important story of American's Revolutionary heritage.